The maximalist approach of STRIPES? Wow! This all-striped look is just amazing! OBSESSED WITH THESE PANTS.. AWESOME STYLING TOO..LOVE THE HORIZONTAL AND VERTICAL STRIPES TOGETHER! Completely flawless – love it all! I couldn’t agree more my dear Veronica!! In this case you indicate how stripes can be the perfect attire for uber stylish and fashion conscious ladies!! Particularly love the feminine allure offered through the ladylike heels exposed through the long pant legs and the dash of color splash through the accessories! Beautiful outfit! 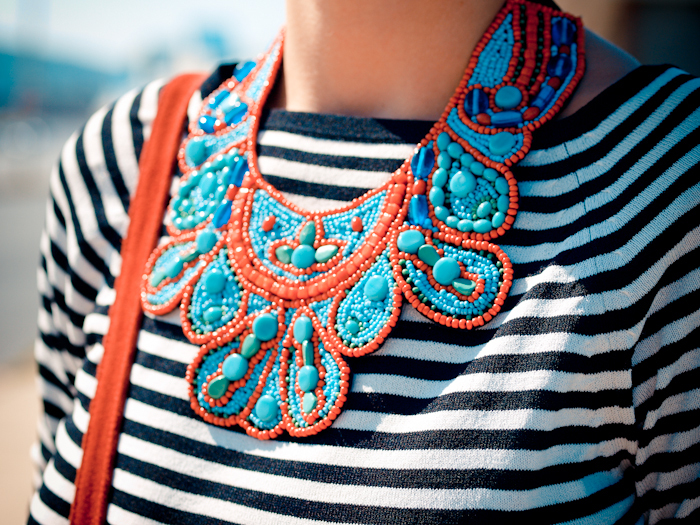 I love the combination of stripes and the burst of color from your necklace. Обожаю полоску!Интересное сочетание с аксессуарами. Fabulous look! Love the necklace! amazing necklace and awesome pants! Veerry nice look!And i love your necklace! I love the horizontal & vertical mix! lovely dear, photos are amazing, the light is perfect! this look is amazing! I would never have guessed, but the pieces work together beautifully! Loving the stripe on stripe action! And that necklace is killer! I’M HYPERVENTILATING JUST LOOKING AT THE NECKLACE! KUDOS, YOU FOUND A PERFECT WAY TO DO STRIPE ON STRIPE, LOVE! That necklace is stunning, a real eyecatcher! I really love the opposing stripes! The wide legged style looks so amazing on you. cool combination! Love your necklace! I love your necklace is very strong! It’s gorgeous! I seriously love how you can pull off these bold looks with absolute ease and look amazing in them. Your sartorial risk taking pays off, as evidenced by this gorgeous ensemble! Your blog is quickly becoming one of my favourites! It’s a very nice outfit. I love stripes. That necklace is beautiful. my dear this is an amazing look you have a great sence of style, i love these pair of pants!! I hope that you can have the chance to see my blog too. Love the all striped outfit, you nailed it! Stripes on stripes – I LOVE IT! The necklace really ties it all together, you look great Veronica! Wow, I love that necklace! Talk about a “statement piece” of jewelry! Hi Veronica. I love these pants! Just wondering about the fit…do they run true to size? Yes,they do run true to size . I like how the stripes make the classy black and white look more playful! and it’s a great way to inject some colour through accessories!